En route to Salt Lake City, intending to start over, their car breaks down near the struggling mining town of Helper, Utah—and then Tony leaves Kora behind. 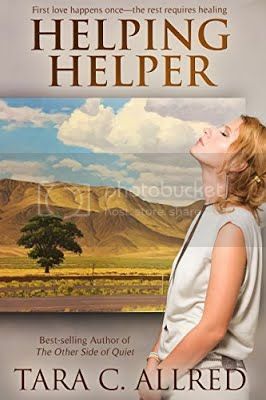 Alone, broken and angry, especially that her family was right in their judgment against Tony, Kora decides to stay in Helper and aid in it’s art-centered transformation. But in working to save her new home, Kora learns first love only happens once. For a second chance at love, a much greater risk is required. “Oh no!” With his long fingers, Tony gripped the steering wheel and leaned forward. The engine went quiet. Suddenly, the car was coasting. Tony steered it to a halt along the dirt shoulder. Smoke poured out above them. He shrugged, but Kora caught the alarm surfacing in his eyes before he turned to the door. As soon as he lifted the hood, the full force of steam released itself, tumbling out toward the blue sky. She opened the passenger door. The hot desert air greeted her. She slipped on her old heavy sandals and approached the hood to find Tony clutching his forehead, his lips moving, hot words streaming out. But when she got close, his speech ceased. Like a poorly-choreographed dance, he slipped past her, making his way nearly the entire circumference of the car before sliding back into the driver’s seat. Kora stepped toward the engine, steam hitting her face. She shifted away. Warmth from the sun hit her back. Another step and she watched Tony turning the key in the ignition. He shifted from the driver’s seat, causing Kora to step back. “I just got to see how far a garage is.” He marched over to the hood. “Get some help towing this in.” He released the hood prop, then slammed it shut. “Does the car need to cool off more?” she asked. “Doesn’t matter,” he said gruffly. “Should I come with?” she tried to sound sweet, but an edge from hours before lingered there. “Then let’s walk.” Kora grabbed her purse and looked back to see Tony studying her thick wooden sandals. He shrugged then turned back to the driver’s door, retrieved the keys, locked the Buick doors, and began their march toward help. Gravel crunched under Kora’s sandals. With each step, she listened to the shifting of rocks under her small frame. Where most couples gain weight after marriage, often both she and Tony had lost pounds during their six years. With the back of her hand, she swiped away sweat drops running down her face, only to feel more accumulating at her hairline. The sun’s rays seemed to beat in anger, lashing vengeance on Kora for her unkind words to Tony. At the start of their journey, she hadn’t meant to be so harsh. But the words had just come, one after the other. Spite building on each beating word. Now she watched him walk, his hot boots tromping down on the gravel in front of her. His crunch louder than hers. “How much further?” she called out to him. At first there was no response. Then he shrugged. She shrugged back, sharing hers with no one except the wrath of the sun. While her feet carried on their rhythmic crunch, Kora looked up in defiance at the sky. Then for a moment, she closed her eyes and let the flaming air greet her face. She sensed the sun challenging her, pushing her until she begged for relief, but she would carry on. Her father had blamed her for such intense commitment, such loyalty inside her. He had seen it as her weakness. She saw it as her strength. And with that strength, she’d get through this, she’d find a breeze of hope, a sweetness in this life Tony had promised her. A fulfilment that was long overdue. By the year 2000, which was only four months away, Kora would have the future she wanted, the earnest desires of her heart. She opened her eyes to see a pillow of cloud, a bright, white cloud, shifting toward the sun, the promise of temporary relief. Once the sun was covered, she saw the radiant blueness, set against the red desert hills that surrounded them. She also saw the road, the long highway that stretched out into the hills in front of them. Then she spotted it, a structure, a building of sorts, followed by another. She extended her stride, just as Tony did. The town was coming. Soon the green highway sign welcomed them to Helper. And they followed the descending road until Kora spotted Speedy Lou’s, a fast food joint, which although run down, seemed able to offer some form of refreshment. Tony arrived before her, pausing in front of the entrance, as if Kora’s slow steps had spoken to him. “Do you want to stop here?” he called out. She dropped a nickel followed by a dollar bill onto the table. It wouldn’t go far, but it was something. “You sure?” she said, looking at her offering with a slight laugh. Then she glanced up, catching his look, a softness in his eyes that hadn’t been there in weeks. He added a dollar to the humble pile. “Yeah. I’ll keep going, see what kind of help’s here.” Then he slipped out the door. But before Kora could manage the strength to stand, the door’s entrance bell rang, and there he was again standing above her. “Here.” He set down a small stack of folded bills. His hand slid over hers, and the touch surprised her, as did the tenderness in his voice. “No. It’s for you. Just don’t go overboard on your hamburger fixings.” Then he kissed her forehead, a gesture he hadn’t made in days, before slipping back out the door. Kora unfolded the bills to find along with the ten, two fives, and a twenty-dollar bill. She stood up and looked out the window, but he was gone. 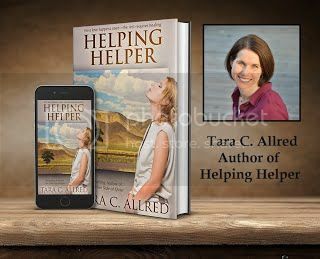 TARA C. ALLRED is an award-winning author, instructional designer, and educator. She has been recognized as a California Scholar of the Arts for Creative Writing and is a recipient of the Howey awards for Best Adult Book and Best Adult Author. She lives in Utah with her husband. Her other published works include Sanders' Starfish, Unauthored Letters, and The Other Side of Quiet, a 2015 Kindle Book Award Finalist and Whitney Award Winner. 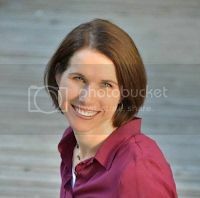 To learn more about the author, visit www.taracallred.net.